Cub Scouting has a language all its own. If you are not familiar with it, below are definitions of many terms you will encounter as you get more and more involved in the program. To earn the any rank badge, Cub Scouts must complete Adventures found in their Handbook. The Adventures cover these areas: Duty to God, Country, Family and Self. This is the highest award a scout can earn in Cub Scouting - also the ONLY (non-religious) award from Cub Scouts which can be worn on a Scouts BSA Troop Uniform. These are generally third grade Cub Scouts, who work on activities in the areas God, Country, Family and Self. They will complete 7 or more Adventures with their den and family to earn the Bear Badge. 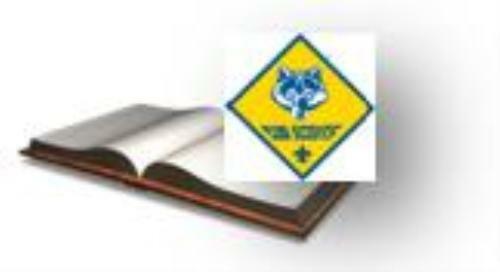 Every scout who joins in grades 1-5 must first earn the Bobcat badge. Doing this, he learns the basic tenets of Cub Scouting: the Scout Oath, the Scout Law, the sign, the handshake, the salute, and the motto. A Scout is between the ages of 11 and 18 and belongs to a Troop. He or she advances through these ranks: Scout, Tenderfoot, Second Class, First Class, Star, Life, then Eagle. The Boy Scouts of America is a nationally chartered organization that encompasses Cub Scouts, Scouts BSA, Venturing, Sea Scout, and Varsity Units. Each Unit must have a sponsoring organization, such as a church, service club, etc. Pack 920 is sponsored by the Christ Fellowship Church. This is the group of adult volunteers who “run” the Pack. Any interested adult is welcome to attend Committee meetings. The Council is an organization of professional Scouters that oversees all Cub Scout Packs, Scouts BSA Troops and other units in an area. Pack 920 is part of the Circle Ten Council. A Court of Honor is a special awards ceremony. Awards may be presented at any Pack meeting, but there is a special ceremony for presentation of awards at a Court of Honor. A Cub Scout is any member of BSA in kindergarten through fifth grade (or age 6 - 11). The Cubmaster is the chief adult volunteer leader. The Cubmaster runs the Pack meetings, and advises all other leaders. The Den is a group of Cub Scouts who meet at regular intervals. Ideally, a den consists of 6 to 8 scouts who are all working toward the same rank. The adult volunteer who is in charge of planning and running den meetings is the Den Leader. Individual Den Meetings are held for each rank level of Cub Scouts. These usually occur at a regular intervals. Each Council is divided into a number of Districts. Pack 920 is part of the Iron Horse District. Randy Cook is our District Chair, and oversees the activities of all Units in the District along with District Commissioner, Craig Aman and District Executive, Michael Hall. The District Executive (DE) is the ONLY BSA paid staff member in our district. All other adults are volunteers. Each level of Scouting has its own Handbook. The Handbook is ESSENTIAL for your Scout, as it spells out the requirements for advancement, as well as providing a place to record completion of the same. Lion Scouts are kindergarten boys & girls who, with an adult partner, participate in Lion Adventures. The Lion Scout program serves as an introduction to the Cub Scout program. Lion Scouts and their families are encouraged to participate in Pack events. The adult partner of a Lion Scout, usually a family member, is the Lion Partner. Lion Scouts are REQUIRED to have a Lion Adult Partner at all scout activities. The whole group - all of our dens and families together is called a Pack. The Pack usually meets once every month. The Rank Badges, in order, are: Lion, Bobcat, Tiger, Wolf, Bear, Webelos, Arrow of Light. Pack 920 uses Scoutbook.com for tracking each scout's Adventure and Awards completion. Each parent will be given a login to monitor and enter their scout's activities. Tiger Scouts are first grade boys & girls who, with an adult partner, participate in Tiger Adventures. The Tiger Scout program serves as an introduction to the Cub Scout program. Tiger Scouts and their families are encouraged to participate in Pack events. The adult partner of a Tiger Scout, usually a family member, is the Tiger Partner. Tiger Scouts are REQUIRED to have a Tiger Adult Partner at all scout activities. The Uniform is the prescribed clothing for any and all official Cub Scout events. In Pack 920, the minimum Uniform consists of a uniform shirt, (with all patches), appropriate neckerchief, and Denim Shorts or Pants (Official Scout Pants and Shorts allowed). Webelos Scouts use the “colors” for activity pins. For “casual” events, a Cub or Webelos Scout T-shirt and shorts is acceptable. Lion Scouts wear the Lion Scout T-shirt. Webelos means WE’ll BE LOyal Scouts. Whether there is one or many of this rank, we refer to the scout as WEBELOS (with an “S”at the end) For example: One Webelos, Two Webelos, Three Webelos, etc. These are fourth and fifth grade Cub Scouts, who work on Webelos Adventures. These activities are designed to prepare the scouts for the merit badge methodology utilized in Scouts BSA. These are generally second grade Cub Scouts, who work on 7 or more Adventures, both with their den and at home with their family. Each individually chartered Pack, Troop, or Crew is a Unit.